These are ancient sites that offer a look at the civilizations that preceded ours. Mesa Verde, in southwest Colorado. Ancient Pueblo people began building these intricate cliff homes during the 1200s and had abandoned them by 1300. The dwellings were discovered in the 1880s, and they still give a glimpse of what life was like for some of the earliest Americans. Pompeii, the Roman city destroyed by an eruption of the volcano Mount Vesuvius in 79 A.D. The ash that covered the 10,000 to 20,000 people who lived in Pompeii also perfectly preserved them and their world. Tikal, an ancient Mayan city in Guatemala. The city was built in 200 B.C. and became an important seat of power in the Yucatan until it was abandoned in 900 A.D. The jungle overgrew the site, which remained hidden until 1848. Now visitors can see six pyramid-shaped temples, including one that is 212 feet tall. These are manmade architectural wonders designed and built thousands of years ago. The Pyramids of Giza, in Egypt. Engineers and scientists have not been able to agree on how the ancient Egyptians built these amazing structures. The Great Pyramid, for example, was 481 feet tall when it was built 4,500 years ago. The Taj Mahal, in Agra, India. 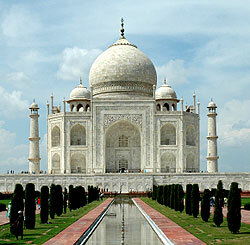 The white marble structure was built in the 1600s by an emperor in memory of his wife, who died in childbirth. The Indian government is undertaking a massive restoration effort on this site, which has become a symbol of undying love. Easter Island, off the coast of South America. The island, governed by Chile, was settled by Polynesians around 800 A.D. When it was re-discovered, on Easter Sunday, 1722, it was virtually empty – except for almost 1,000 gigantic statues averaging 13 feet tall and 14 tons. No one is sure what the statues represent, or how a tiny community on an isolated island managed to create and move them. The Great Wall of China. Actually several different walls built between the 7th century B.C. and the 17th century A.D., the wall stretches about 4,500 miles. It is probably the largest building project ever undertaken. These sites are best observed at a specific time. The aurora borealis, or the northern lights. This atmospheric phenomenon is best viewed north of 60 degrees latitude. It is most magnificent around the fall and spring equinoxes, on a clear night. The Serengeti plains of Africa. Each year, a gigantic migration of animals moves across the Serengeti. January to March, during calving season, provides the best look at the predators, while the dramatic Mara River crossings in Kenya are best in September and October. Iguazu Falls, at the confluence of Paraguay, Brazil and Argentina. These are actually a collection of more than 200 waterfalls along a river gorge. They are best seen when the river is high, in January through March -- and especially fantastic by the light of a full moon. Machu Picchu in Peru. The city was built in the 15th century as a retreat for the Incan emperor and his friends. It was rediscovered in 1911 and called the “lost city of the Incas.” It is impressive and inspirational at any time, but it is especially moving at sunrise. These are examples of man’s finest art and design. The Louvre, in Paris. It is one of the oldest museums in the world, opened in 1793. And it has one of the most impressive collections of art, including the Mona Lisa and the Venus di Milo, spanning from ancient Rome and Greece to modern times. Zen Garden of Kyoto, Japan. The garden is 98 by 32 feet, and it contains 15 rocks of various sizes put into five groups on a base of white sand. Since the original, unknown, designer left no key, visitors can find their own meaning by contemplating the garden. The Uffizi Gallery, in Florence. Built in the 1500s and opened to the public as a museum in 1769, the Uffizi houses an unsurpassed collection of Renaissance art, including The Birth of Venus, by Botticelli, and Annunciation, by daVinci. Fallingwater, the Frank Lloyd Wright-designed home in Pennsylvania. When he designed the home in 1935, Wright included visual elements that mirrored the waterfalls that the house is built above. These are special natural wonders you should experience in person. The Yangtze River in China. Over its almost 4,000 miles, the Yangtze shows China’s environmental diversity and touches on its past, present and future. Antarctica. The coldest place on earth is also the world’s largest desert. Its stark white landscape is humbling, and it offers a chance to see glaciers and penguins up close. Mount Kilimanjaro in Tanzania, East Africa. Nine out of every 10 people who attempt the 19,340 foot climb turn back before the summit. But for that one in 10, the experience never leaves. The Grand Canyon, in Arizona. Visitors can look at the 277-mile long, 18-mile wide, 6,000-foot deep canyon from any number of vantage points. But to really experience it, try hiking through it. These ancient temples seem to bear the hand of the almighty. Pagan, Myanmar. More than 3,000 temples cover a 30-square-mile plain. Most were built between 1057 and 1287. The Parthenon, in Athens. At the top of the Acropolis, this temple to the Greek goddess Athena was built more than 2,400 years ago. Angkor Wat, Cambodia. The main temple among more than a dozen in Angkor, which served from the 9th to the 15th centuries as the capital of the Khmer Empire. Ephesus, in Turkey. Little remains of what was once a huge temple to the goddess Artemis. But visitors can also see the Church of St. John, built over what is believed to be the grave of the gospel writer. See these places before they are gone forever. Venice, Italy. This city, which was built on 118 small islands with its famous canals instead of streets, is sinking at a rate of 2½ inches per decade. The Amazon rain forest. It is huge, at more than 2 million square miles through eight countries in South America and housing more than one-third of the world’s species. But 20 percent already has been cleared for timber or farming. The Great Barrier Reef, in Australia. The world’s largest coral reef is actually a collection of reefs more than 1,250 miles long. But global warming and pollution are creating serious stress. The Galapagos Islands. The islands were the basis of Charles Darwin’s study of evolution. But they are being threatened by pollution, over-fishing and tourism.